Toy Story Mania is a blend of old and new, a bit like what might happen if a 3-D version of the Toy Story film, a video game, and a carnival midway collided. Situated on Paradise Pier Midway, it takes its inspiration from old-fashioned games of skill, like the ones you'd find at a county fair. Riders travel in small vehicles, two to a side. The basics are like those old-timey midway games where you throw a ball to break a plate, throw a dart at a balloon or toss rings onto milk bottles. Each rider has their own small "gun," which looks like a colorful, mini-cannon fired by pulling a cord. The games are cleverly constructed, and the 3-D effect (along with a few strategic blasts of air) add a nice level of realism to the play. The trip is short in distance, with stops at a practice area before going on to try a variety of games. It's easy enough to hit the biggest targets even if you're not very good at that kind of thing, making this attraction a hit with everyone from this fifty-something travel writer to the 8-year-old boy we met coming off the ride, who thought it was great. Toy Story Mania! is a ride that you'll want to keep going back to, trying to find those high-value targets and improving your scores. What You Need to Know about Toy Story Mania! 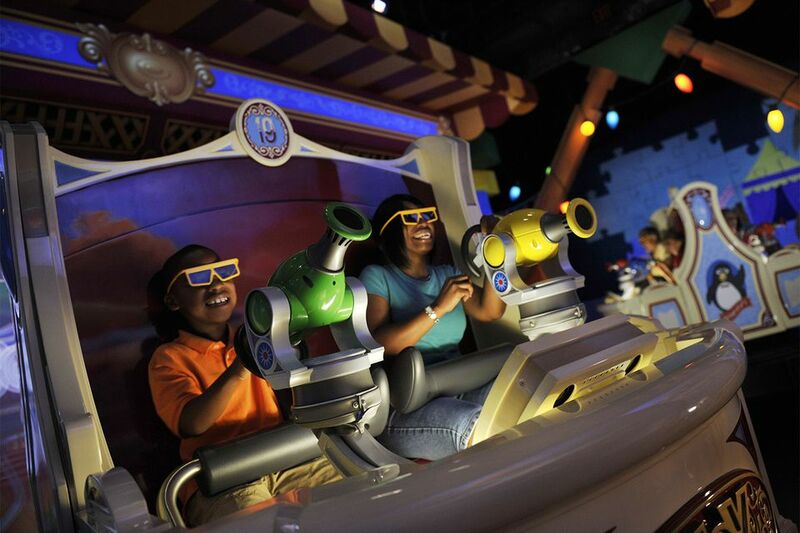 Seating: Each ride vehicle has a bench seat and two laser cannons. You step up just a little and get in. Accessibility: You'll have to transfer from your wheelchair or ECV to the ride vehicle by yourself or with help from your traveling companions. Enter with everyone else and ask a cast member for instructions. How to Have More Fun on Toy Story Mania! This ride offers a child swap for parents who have small children and want to take turns riding. Before you go on the ride, stop and listen to Mr. Potato Head's smart remarks. For more fun, play with him. If he says “Oh, it’s you!” have a smart response ready. Sigh and say (with just a hint of longing) “Yes, it’s been so long.” and watch this eyes narrow and blink as if he’s trying to remember who this person is from his past. Keep an eye out for small targets and those that appear for only a short time. They're worth a lot more points. Some riders take careful aim and take pride in the fact that they hit a high percentage of their shots. I take the opposite approach, shooting as fast and as often as I can. In most cases, my approach wins. To maximize your score, some people suggest riding alone. Don't waste time on low-value 100 point targets and try to unlock the big ones. You can get a lot of detailed tips for high scoring at Disney Every day. Riders wear 3-D glasses on this ride. If you wear prescription glasses, just slip the 3D ones over them. Unfortunately, they come in one size only and are too big for a small child’s face. A simple solution is just not to wear them. Most kids don’t seem to mind that things get a little blurry without them - and they won’t be startled or scared by things that come flying toward them in the 3-D effect. Or try this: Perch the glasses on the child’s nose, tile them forward and rest the earpieces on top of their head. If your game finishes but your car can't move yet, you can still shoot the targets in front of you. You won't gain any extra points, but you will have a chance to improve your aim, and you won't get bored. Like most rides at Paradise Pier, this one closes early on days when there's a World of Color show. Check the daily schedule to be sure you don't wait too long and miss out. Fun Facts About Toy Story Mania! The Mr. Potato Head outside is the first Audio-Animatronics figure whose mouth appears to form words. It took more time programming than previous Audio-Animatronics created by Walt Disney Imagineering. When it opened in 2008, a sister attraction opened at the same time at Disney's Hollywood Studios in Florida. It was the first time that Walt Disney Imagineering created an attraction for two Disney Parks simultaneously. It takes over 150 computers and multiple networks throughout the ride, to respond to each riders' shooter and how their midway tram moves. This making it a fair "shot" for everyone to have fun.